Duke University has hired as the new director of its $3 million Islamic Studies Center a controversial Iranian-American professor whose scholarship has come under fire for anti-Israel bias and who once used a picture of dead Jews in Nazi death camps to illustrate his writing on the Palestinians. 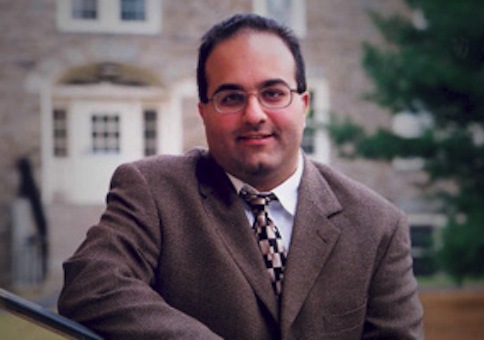 Omid Safi, a former professor at the University of North Carolina, was installed this week by Duke as the new director of the school’s Islamic Studies Center (DISC), which was handed $3 million specifically for the directorship position. Safi, whose writings on Islam have been criticized as faulty and "utopic" by other scholars, celebrated his new job on Facebook, writing in his "first comments in my capacity" that he seeks to produce "a knowledge that is efficacious, transformative, and above all, beneficial." He led these comments with the common Arabic term, "insha’allah," or "If Allah wills." While Safi has received praise from some for striking a "moderate" tone in his writings, human rights leaders and pro-Israel commentators have repeatedly expressed concern about his equivalence of Israel to the Nazis and other controversial rhetoric. "Safi sometimes styles himself as a moderate, and he has had some positive, conciliatory things to say about Jewish people. On the other hand, he has also urged ‘radical’ change in Israel and the United States, and some of his comments about Israel are worse than acerbic," said civil rights leader Kenneth Marcus, a former staff director at the U.S. Commission on Civil Rights. "We have been especially concerned about his misuse of Holocaust imagery to support his anti-Israeli rhetoric," added Marcus, who serves as president and general counsel of the Louis D. Brandeis Center for Human Rights Under Law. "This is deeply offensive and raises questions about his academic judgment." Safi came under fire last year when he illustrated an article about Israel’s 1948 attack on the Arab village Deir Yassin with a photograph of dead Jewish Holocaust victims, an equivocation that experts refer to as "Holocaust inversion." The article, published by Religion News Service (RNS), was eventually removed due to "inaccuracies" in Safi’s writing. Human rights leaders at the time condemned Safi’s article and the use of the Holocaust photo as completely inappropriate. "This misuse of this Holocaust image illustrates the concept of ‘Holocaust inversion,’ which is used to describe the practice of Jews, Zionists, or Israelis of behaving like Nazis or having culpability for Holocaust-like crimes," the Brandeis Center said in a statement at the time. "Holocaust inversion is often described as an indicator of anti-Semitic expression," the center said. "The U.S. Department of State, for example, has explained this phenomenon as a kind of ‘Holocaust denial or trivialization’ in its report on Contemporary Global Anti-Semitism." The article itself contained "dozens of lies" about Israel, according to the pro-Israel blogger Elder of Ziyon, and relied on writings published by the website Counterpunch, a conspiracy theory website that has been described by the Anti-Defamation League (ADL) as an "anti-Zionist radical left newsletter" and by media monitors as an "extremist anti-Israel web site." Before the article was removed in its entirety, Safi—under pressure from critics—removed the Holocaust photo and replaced it with one also unrelated to the incident at Deir Yassin. "The esteemed professor Safi cannot even do a decent job in basic research skills," the Elder of Ziyon blog wrote at the time. "He saw the photo at an anti-Israel site as being ‘Deir Yassin’ and believed it wholeheartedly." Other writings by Safi have come under fire from fellow academics for "bad scholarship." Safi referred to one of his critics, Jewish studies professor Aaron Hughes, as a racist due to Hughes’s critique of Safi’s work. Hughes wondered in a February article about the controversy if "perhaps Safi is upset because I occupy a chair in Jewish Studies? We all know that Jews are the arch-enemy of Islam." Hughes further accused Safi of "engaging in innuendo and identity politics." Safi more recently penned an article earlier this month, also for RNS, in which he railed against Israel’s "occupation" and referred to the non-existent state of Palestine as "a symbol of Muslim impotence and failure, a symbol of colonial power and Zionist success." "Let us not mince any words here," he wrote. "Palestine is al-Nakba, ethnic cleansing since 1948, where half of the indigenous Palestinian population, Muslims and Christians, were made homeless and stateless, replaced by Jewish immigrants as part of the creation of the modern nation-state of Israel." "This is Palestine, under occupation from 1967," he continued. "This is Palestine, which in the West Bank now sees a level of occupation, humiliation, dispossession, and segregation that leads South Africans like the Nobel peace prize winner Desmond Tutu to observe many similarities with apartheid-era South Africa." "This is Palestine, with Gaza being a place under siege, under-employed, under bombs, under-nourished, thirsty, poor, and suffering," Safi wrote. An email to Duke University’s press team asking for comment on Safi’s controversial past was not returned by press time. "Duke has a long tradition of extraordinary scholarship in the study of Islam. We are thrilled that Omid Safi will continue that pursuit, both in the study and translation of Persian texts as well the study of contemporary Muslim thought in American and in Iran," said Laurie Patton, dean of Duke’s Trinity College of Arts & Sciences. "DISC will thrive under his leadership and vision, and we are delighted at his arrival."